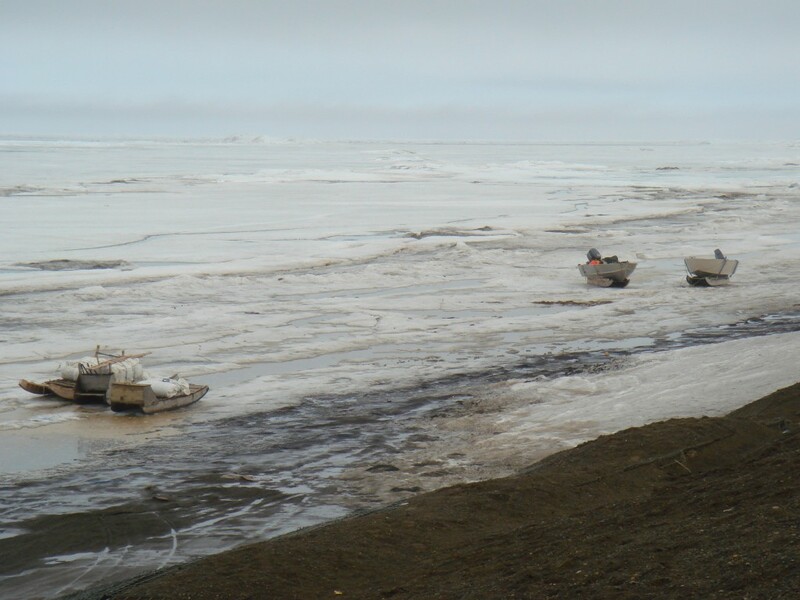 SAGE Magazine is honored to award Amy Mount’s “Beyond the North Slope: Oil drills and discord off Alaska’s Arctic coast” first place in our 2014 Emerging Environmental Writers Contest. Sleds carrying whaling equipment sit on edge of the sea ice near Barrow, Alaska. Photo courtesy of the author. Oil placed me there, on the shores of the Chukchi Sea, my snow boots tentatively toeing the border between gravelly beach and frozen water. I could feel the uncanny stillness of the ice-covered ocean: a grey-blue-white seascape painted with a long dark winter’s brush. It had grown a temporary topography, the frozen layer exhibiting a kind of plate-tectonic behavior, pushed and pulled by currents and tides, leaving not a smooth surface but one of ridges and fissures. The ice and I were in the Arctic: north of the tree line, north of the Arctic Circle that marks the extent of 24-hour darkness in winter and 24-hour daylight in summer, and I had travelled there to research the charged politics surrounding plans to drill for oil out in the Chukchi. Behind me lay the town of Barrow, the northernmost city in North America, only one thousand miles from the North Pole, where the North Slope of the Brooks Range meets the Arctic Ocean. The shingled seashore I was standing on disappeared in front of me under the frozen sea, but I could imagine the ground feeling its way downward, plunging with the continental shelf’s slope under an increasingly heavy weight of water. At a point 70 miles out, or thereabouts, is an area of the United States’ Outer Continental Shelf that the federal government has parceled into square boxes and leased for $2.7 billion to an array of oil companies, new members of the Arctic marine ecosystem such as ConocoPhillips, Statoil, Repsol, and of course Shell, the supermajor that sits like a cool, bulky polar bear at the top of the industrial food chain. The name “Arctic” originates from the Greek word Arktikós, meaning the land of the Great Bear—not the shaggy white Ursus maritimus that has become so emblematic of the region, but Ursa Major, the constellation that prowls around the North Star, Polaris. The stars cast their ancient light over the frigid northern ecosystem, the land and sea, and the community of plants, creatures, and people that live there. It’s a difficult place to live, yet hardy people, adapted to the cold and the seasonal darkness, have inhabited areas of the Arctic for millennia. The indigenous people of Alaska’s north coast are the Inupiat, and they say that the Arctic Ocean is their garden—or their Safeway store. 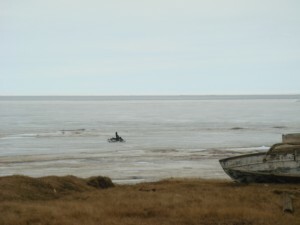 Even today, Inupiaq livelihoods still substantially depend on hunting marine mammals, such as seal and walrus, for food. Their most highly valued harvest from this briny backyard—nutritionally and culturally—is the bowhead whale. Before I embarked on my research trip to Alaska’s far north, I thought I had a pretty clear understanding of the lay of the land. The Arctic ecosystem is a relatively simple one, made up of just a few, specialist species, and is consequently particularly sensitive to pollution and environmental changes. The region is already undergoing considerable upheaval as warmer temperatures shrink the summer sea ice: the minimum extent in 2012 was fifty percent less than the average for the 1980s and 1990s. The arrival of Big Oil and its offshore drill rigs could not possibly be good news for the whales and other sea creatures, I thought, and neither could it be good for the local people who subsist by hunting those animals. But rather than encountering a straightforward struggle between the Inupiat and the oil companies, I found that the debate about offshore oil was far more complicated. Local attitudes toward the prospect of offshore drilling were diverse, nuanced, and sometimes inconsistent. Local politics were as fraught as any other theater of American democracy, and I realized that I too was playing a part in this oily drama, as if I were among a cast of characters who swapped costumes every time I turned my back. I had to ask myself: who was endangering whom? A polar bear skin dries behind a snow machine in Wainwright, Alaska. Photo courtesy of the author. Barrow’s streets are full of intimations that, while this is no igloo-dwelling community of timeless Natives, neither is it a place that has forgotten its heritage and discarded the knowledge and traditions of its elders and ancestors. The morning I first encountered the Chukchi Sea, I reached the beach on foot, plodding along the dusty gravel roads past wooden buildings, many of the houses painted in seaside colors: pink, purple, blue, yellow, and green, cheerful against the surrounding subdued palette of ice, snow, and dirt. A husky barked at me from outside one of the houses, climbing into a snowmobile and warning me from the driver’s seat not to come near. But mostly the town felt very quiet. I later learned that the streets used to clamor noisily with the sound of sled dogs, but after people were able to afford snowmobiles (or snow machines, as they’re known in Alaska) they decided they had no further use for the dogs, whose upkeep was expensive, and so summarily shot them. Today, the growls you hear most often are the motorized sounds of the snow machines in winter, and the ATVs that zoom around in the summer months in clouds of dust, speed-hungry youths at the helm. 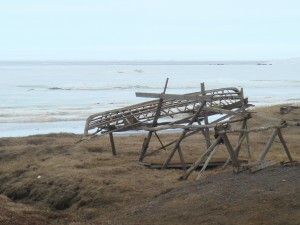 The wooden frame of a whaling boat sits along the sea in Barrow, Alaska. Photo courtesy of the author. The narrow wooden frames of umiaqs—whaling boats—were stacked up beside their captains’ houses, temporarily bare without their sealskin covers. Outboard engines were lying nearby, wrapped in blue tarps. Caribou skins had been slung up to dry like clothes on wooden washing lines. The car-sized skull of a bowhead whale had been placed, sculpture-like, outside the City Hall; the ocean-going giant might have been 150 or 200 years old at the time it was harpooned. 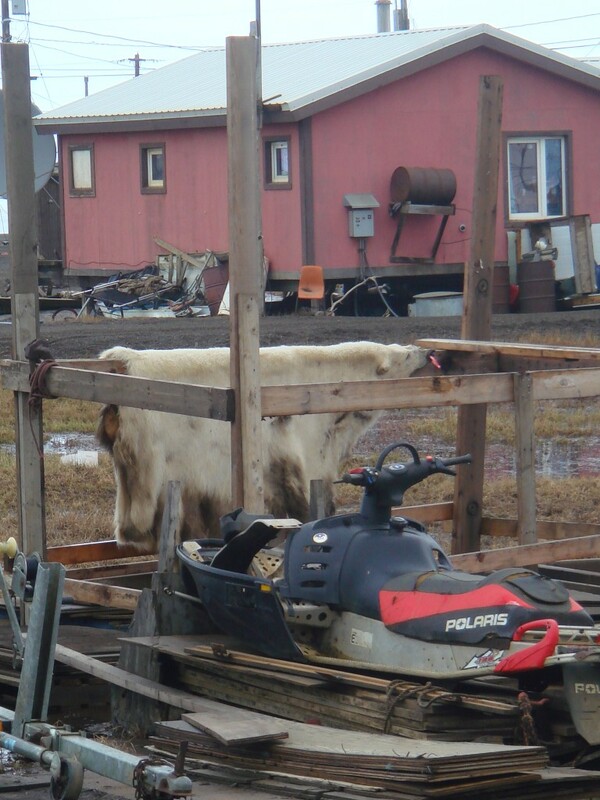 Survival has long been a way of life on the North Slope, so Barrow’s residents can’t afford to be romantic about old equipment when new and better devices come along. If a hand-held GPS gadget makes it easier to track caribou and less likely you’ll get lost in the tundra, use that GPS. Old-fashioned umiaqs, though, remain in use because they are quieter than aluminum-hulled boats and less likely to scare off the whales. The result is a pragmatic hybridity of Native and non-Native, ancient and modern, subsistence livelihood and cash economy—all jumbled together in Barrow’s streets, in a way that is not always tidy, but is at all times functional. Old tools are retained until they are no longer useful, like the sled dogs, while, underneath these changes, the rhythm of the community remains the same: spring whaling, fall whaling, summer sun, and winter darkness. The bowhead whale’s first encounter with the oil industry was in the middle of the nineteenth century, when markets in the contiguous United States were baying for whale oil to use as lamp fuel. Yankee whalers, as they were called at the time, sailed further and further abroad in search of the unlucky leviathans; eventually, the whalers pushed north through the Bering Straits and arrived in the Chukchi Sea. The bowhead population plummeted. Referred to by some historically-minded Natives as the North Slope’s first offshore oil rush, the industrial-scale slaughter only ended when a better kind of lighting fuel was discovered: crude oil from under the ground—allowing today’s oil advocates to claim that the likes of Rockefeller saved the whales. Commercial whaling has been outlawed for some time now, but the International Whaling Commission permits indigenous communities a limited number of “strikes” each year, recognizing that whaling plays an important cultural and nutritional role in Native life. 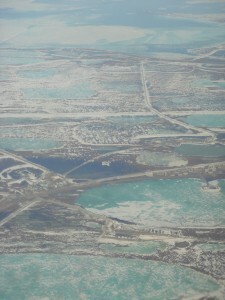 The Prudhoe Bay oil fields from the air. Photo courtesy of the author. The second frenzy of oil activity began in 1967 when, after drilling a dispiriting series of dry holes in northern Alaska, wildcatters struck oil at Prudhoe Bay. Subsequent exploration confirmed that this was an “elephant field”—truly massive. The oil industry was keen to begin building an 800-mile pipeline south, to the ice-free port of Valdez, where the oil could be loaded into tankers and shipped to refineries in California, Hawaii, and Washington. There was one glitch: title to the land was unclear. The U.S. government, having purchased Alaska from Russia one hundred years earlier, had until that point chosen to ignore Alaska Natives’ protestations that they had an age-old claim to the land, which they had inhabited long before the concept of national borders were invented. Congress responded with the Alaska Native Claims Settlement Act in 1971: Alaska Natives were assigned 40 million acres, plus $925.5 million in payments to compensate them for giving up their claims to the rest of the land and to oil, natural gas, and mineral rights. The Settlement Act provided for the creation of Native corporations—one for each village, plus thirteen larger regional entities—among which the settlement funds were divided. The corporations would legally own the land and take responsibility for the compensation money. The Arctic Slope Regional Corporation covers the area of Alaska that lies north of the Brooks Range—an expanse the size of Utah. Today, it is the largest Alaskan-owned corporation, with a thriving set of subsidiaries that largely function as contractors on the Prudhoe Bay oil fields. All of its shareholders are Alaska Natives from within that northern region. Ten years after the Prudhoe oil field was found, the first wells began extracting black crude oil and funneling it into the pipeline system. Since then, the North Slope Borough has been collecting large property taxes from the industry and using the money to fund public services and create employment for Borough residents—a flow of benefits that has ensured that the onshore oil industry around Prudhoe Bay is relatively uncontroversial within North Slope communities, whose quality of life has been utterly transformed. The Inupiat have been able to invest in new infrastructure and buy previously unaffordable goods that support their subsistence practices—epitomized perhaps by the snowmobiles that helped kill off sled dogs and hunt more seal. Those onshore oil fields, however, are beginning to run dry. The pipeline is now only one-third full, and the industry’s attention has shifted to the oil thought to lie offshore. Although drilling into the seabed is not yet underway (Shell and its ilk having been held back by regulatory impediments and technical misadventures), it is proving to be far more divisive than its terrestrial counterpart. 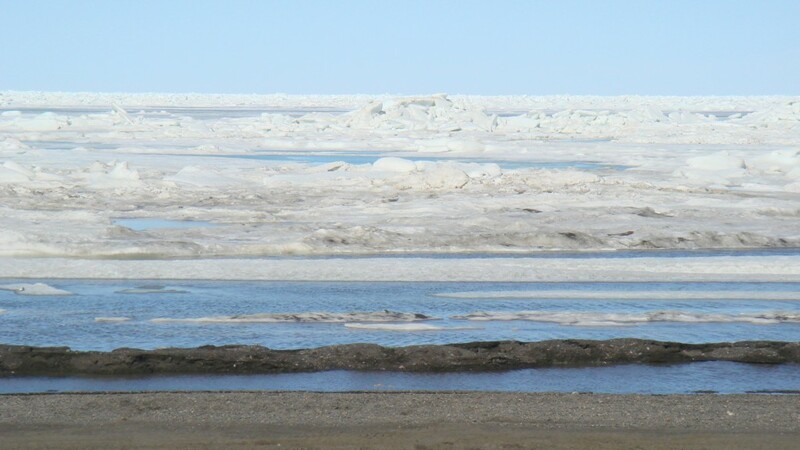 A view of the Chukchi Sea from the coast of Barrow, Alaska. Photo courtesy of the author. Nevertheless, the Inupiat are a coastal people who depend heavily on the ocean, and particularly on the bowhead whale. Some of the animals they hunt, such as the caribou and freshwater fish, live inland, but even river-dwelling creatures could be affected by an oil spill if pollution were to spread up the waterways. Boosters such as Glenn profess to be committed to continuation of subsistence livelihoods, and they assert that whaling and drilling are compatible activities in the ocean. Other local residents are less convinced. They point to events such as the Exxon Valdez oil spill off Alaska’s south coast in 1989, and more recently to the 2010 Deepwater Horizon oil spill in the Gulf of Mexico, and they ask what would happen if something similar happened in the Arctic Ocean. Many are unconvinced by oil companies’ assurances that the sticky, toxic liquid could be mopped up from the unpredictable icy waters, while cleanup crews are battered by the Arctic’s fierce weather conditions. Even if a spill is avoided, the noise of the drilling might deflect whales from their migration path and force them to miss important feeding areas or put them out of reach of the Inupiaq whaling crews. The sled dogs were essentially seen as tools that could be replaced, but everyone I met on the North Slope seemed to agree that there is no substitute for the bowhead whale. “I have never heard a single person in this town say they support offshore oil,” Robert Thompson, an outspoken campaigner from Kaktovik, a village 280 miles along the coast from Barrow, told me. “Why should we? We’ve got everything to lose.” Indeed, with the proposed drilling sites all located on the Outer Continental Shelf, there will be less infrastructure built on land and thus fewer opportunities for the North Slope Borough to tax the industry and channel these funds into local public services. Robert’s is another of the North Slope voices that is heard far away from Alaska. He is part of the REDOIL network—Resisting Environmental Destruction on Indigenous Lands—and was flown out to Shell’s 2012 Annual General Meeting by a coalition of environmental organizations to ask difficult questions like “How will you clean up oil from under the ice?” But offshore opponents are not all dyed-in-the-wool environmental campaigners. “You can drill all you want on land,” the Mayor of Barrow, Bob Harcharek, told me. “Don’t screw up our ocean.” He is concerned that the industry has not proved that it can drill safely and avoid damaging the environment, or clean up a spill. A member of a Wainwright whaling crew drives a snow machine across the sea ice to reach water. Photo courtesy of the author. On 31 December 2012, Shell’s Arctic drillship – the Kulluk – was being towed to Seattle (at least in part, Shell acknowledges, to avoid Alaska’s property taxes) when it ran aground on Sitkalidak Island. Fortunately no oil was spilled or lasting damage done, but environmental groups were quick to pounce on this incident as further evidence of Shell’s unpreparedness for extreme Arctic weather conditions. The Kulluk’s hull had been painted blue, following whaling captains’ suggestion that this hue would be less unsettling to the bowheads. But the Sitkalidak episode demonstrated that no amount of well-meaning decoration would protect the whales from the effects that fierce winds and waves – and mistake-prone human beings – would have on drill rigs. Accidents happen. I sensed that inside many of the Inupiat, a profound anxiety had taken root, born out of frustration with outsiders who could not fathom what it meant to rely on hunting marine mammals for one’s very survival. Some described the issue as “food security,” as a way of stressing the crucial role that whales, seals, walrus, and other ice-dependent species played in their lives. The nutrition gained from eating those animals has sustained the Inupiat for generations in the harsh Arctic environment, and, one woman told me, it “allows us to be warm and function like normal people without having to fall into depressions because we’re lacking a vitamin.” Research by Gita Sharma and her colleagues at the University of Alberta has linked rising rates of rickets, cancer, diabetes, and obesity in Arctic populations over the past 50 years to reduced intake of vitamin D, which is found in abundant quantities in the fatty fish and marine mammals that characterize traditional diets. Nearly everyone I talked with in the southern Alaskan cities of Anchorage and Juneau, before I headed north to Barrow, had spoken as if the conflict over offshore drilling was an Inupiaq problem, a North Slope problem. But, as I said at the beginning of this piece, oil placed me there. From Anchorage, I had boarded a plane that flew me almost due north, jet fuel feeding into engines that propelled me upwards from the subarctic city and over the pyramidal mountains that rumple Alaska’s Interior—the Alaska Range, then the Brooks Range; jagged folds of Earth pristinely draped in snow—all the while belching out a cocktail of unhealthy gases into the stratosphere. “It’s a global dynamic overlaying all this stuff,” Jimmy Stotts told me, “not just Eskimos versus oil companies.” No one has the luxury of playing the part of disinterested observer. The complex geography of cause and effect makes it difficult for me to stand in judgment of local decisions in Alaska’s far north. Oil flows through a global network of pipelines, tankers, and fuel pumps to disparate markets; it is as much extracted by the drillship as it is by consumers’ demands for gasoline, or heating fuel, or jet fuel. Oil spills into all parts of our lives: it spills into our cars and it motors our family holidays; it is a major raw material in our plastic toys, our medicines, and our clothes; and the profits it generates fund national art galleries and researchers’ stipends. 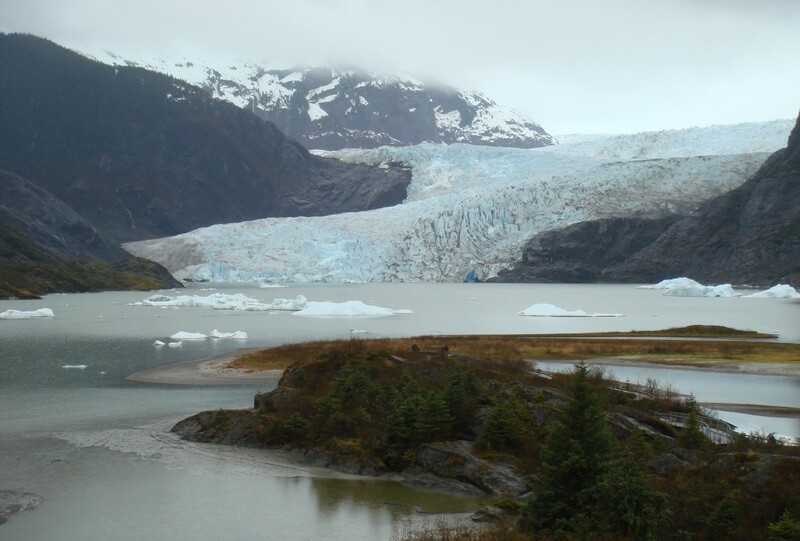 The Mendenhall Glacier has receded more than a mile since 1939. Photo courtesy of the author. The Arctic is the planet’s most rapidly warming region; the average temperature here has risen at nearly twice the rate experienced by the rest of the world. Over the past half-century, winter temperatures in Alaska have increased by three or four degrees Celsius, with larger increases likely to come this century. Scientists attribute this rapid rate of change to the Arctic’s location and physical characteristics. For example, when initial warming causes some sea ice to melt, a positive feedback cycle is triggered because the white, reflective ice is replaced by dark, heat-absorbing ocean. This traps more heat and stimulates more ice melt, uncovering more ocean, which absorbs more heat – and so on. I saw the impacts of regional warming for myself when my research travels took me to rainy Juneau, Alaska’s capital in the southeast of the state. There, I paid a visit to the Mendenhall Glacier, which has receded more than a mile since 1939. Today, icebergs are calving from the glacier’s snout into a newly formed lake. Elsewhere in Alaska, entire coastal villages are making plans to relocate, because the land on which they were built is eroding at an alarming pace. This is due to a combination of climate impacts: the water in the soil, which used to be frozen solid—permafrost—is melting and leaving behind less stable ground. At the same time, sea ice is melting, allowing storm waves to reach the shore. And, on top of that, the rising sea level is pushing storm waves toward higher land. Will climate change do more harm to Arctic biota, and the people who rely on a thriving and stable ecosystem, than would the short-term impacts of drilling? Quite probably. (In the long term, of course, drilling for oil culminates in the release of more greenhouse gases, adding to the momentum of global warming.) The Arctic Climate Impact Assessment, an independently reviewed evaluation, found that the region’s indigenous people face major economic and cultural disruption. The animals they rely on are shifting their ranges, the weather is becoming less predictable, and travel is becoming more dangerous due to the changing ice and weather conditions. Many of the Arctic’s species are ice-dependent. Some of them, such as polar bears, bearded seals, walrus, and some marine birds, face extinction as summer sea ice extent plummets ever further. The bowhead whale, which is considered the most ice-adapted of any whale species, might also decline. The bowheads’ movements are determined by the location of their prey species—miniscule copepods and euphausiids—and it is not clear whether those would adapt to ice-free water. From an Inupiaq perspective, any deviation in migration routes could put the whales out of reach of the umiaqs. Climate change is therefore likely to result in the reduced availability of traditional food for Inupiaq hunters in remote locations, where the store-bought diet is expensive and carries a higher risk of diabetes, obesity, and heart disease. Both food security and traditional lifestyles are under threat, and local infrastructure is also likely to be damaged by permafrost thawing and coastal erosion. The report warns that some northern cultures may not survive. 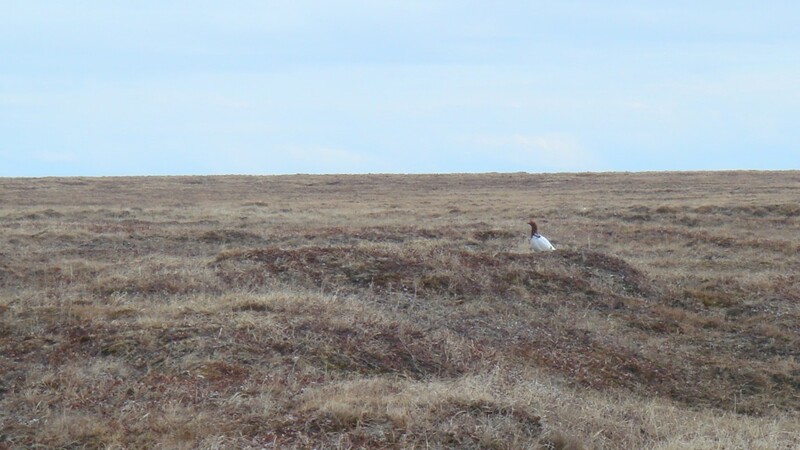 A Ptarmigan on the tundra. Photo courtesy of the author. “We are not going to sell, trade, partner, give away our right to whale,” an ASRC executive said to me adamantly. “Everything else around that we must either fit or not.” But this is not just a North Slope story. The land of the Great Bear is warming as a result of greenhouse gas emissions that have mostly been produced elsewhere—from Californian highways to Connecticut’s home heating boilers. The ASRC executive might not want to trade away his right to whale, but whaling might become impossible anyhow. North Slope residents want to believe they can have both oil and whales; they depend on both of them. But one is slowly thwarting the other, even if there is no Arctic oil spill, because to burn oil and other fossil fuels is to drive climate change. In return, the Arctic affects the rest of the world. Atmospheric and oceanic processes in the far north interact with climatic processes in more southern latitudes, and melting Arctic glaciers contribute to global sea level rise, increasing the risk of coastal flooding in lower-latitude cities such as New York. The Inupiat recognize their role as custodians of the Chukchi Sea—their garden—but the rest of us will also reap what is sown in that vital corner of the Earth. It is our demand for oil that is driving the likes of Shell offshore, and it is our consumption of fossil fuels that is ratcheting up global temperatures. It is not only the Inupiat who need to steward the Great Bear’s icy realm: we all do. Amy Mount is a 2014 graduate of Yale's Joint Degree Program in Environmental Management and Global Affairs. Her studies have focused on the political economy of natural resources and pollution. She has conducted research on the politics of oil drilling in the Arctic Ocean, traveling to Alaska with funding from the Yale Center for Environmental Law & Policy Research Prize. She received her BA in Geography from Cambridge University in 2010 and has worked in environmental and science policy research, sustainability communications, and climate change campaigning. She currently works in energy policy advocacy back home in the UK. Well done Amy. This is a stunningly well written piece on the challenges faced by the indigenous Inupiat people of the northern latitudes and the ever increasing pressure to sustain the economic systems that oil production has wrought on their communities. We will not easily, nor will we soon uncouple, that which has been set in motion, but the growing risks of climate change and what that means for the fragile ecosystems of the Arctic regions must be taken seriously. As we reach, ever more precariously, into far flung regions at the end of the world for the remaining reservoirs of fossil fuel without proper safeguards in place or a major shift in global energy consumption, we will surely put those regions at risk. I, for one, continue to vote for a total ban to any offshore drilling in the Chukchi Sea. It is too damn fragile and once the oil spills, and it will, the last vestiges of a subsistence livelihood for these people will be forever altered if not totally destroyed. Ironically, climate change may be doing that already anyway. Thanks for maiking this journey with an informed and balanced pair of eyes and discerning ears with which to hear the many voices. Never stop writing! You have a gift for communicating complex issues. Thank you for coming and learning on the ground about the Arctic and the National Energy Policy Act. This is very important and you did a good job of keeping this fair and diverse. Thank you for going out to the villages as this is important and many do not go out to do so. Thank you for talking to people and not just organizations as you did. This was key to understanding the complexity of the issue and sharing the variety of views you brought into this discussion. The process has much to grow from and you did a great job of bringing the depth of the issue into the discussion. We have maps at the Northern Environmental Center that shows the amount of issues we are dealing with on the sold lease sale maps. Please look to this to help understand. Alaska has many resources but the national desire for them should not cost the health of the people who live where resource extraction is to occur. Excellent objective coverage, Amy, of a complicated and often convoluted process of modernization, adaptation, cultural heritage and continued subsistence survival. From my point of view, you captured the essence of the Arctic Inupiat as it currently exists and evolves. Quyanaqpak!